LeBron spends roughly $1.5 million annually on training, recovery, and diet. $1.5 million will likely put a small dent on your bank account so we have some “backyard alternatives” for our friends that don’t have full access to Lakers’ facilities. It’s without question that LeBron has ridiculous athletic talent, but it is more than what he does night in and night out on the court that makes him a GOAT. LeBron’s work ethic on and off the court is that of a mule. It his countless hours off the court and unwavering determination to be the best that allows him to continue to play in a more ripe age (poor timing for this article, LeBron! Get your adductor in check!). In his last two years (in seasons 14 and 15), LeBron has led the NBA in minutes per game. Since 2004, LeBron’s been in the top 5 points per game. The dude just turned 34 years a few days ago and is leading this year’s All-Star voting. Here are his secrets to his recovery. 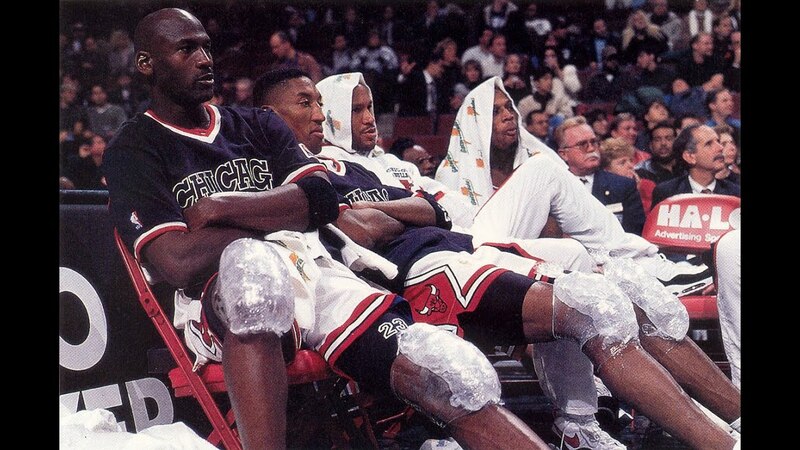 MJ, Pippen, and Rodman icing those knees! 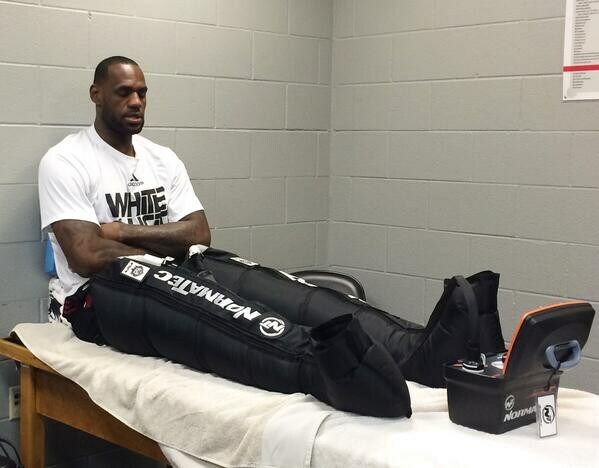 Cold therapy is one of LeBron’s various strategies for recovery. 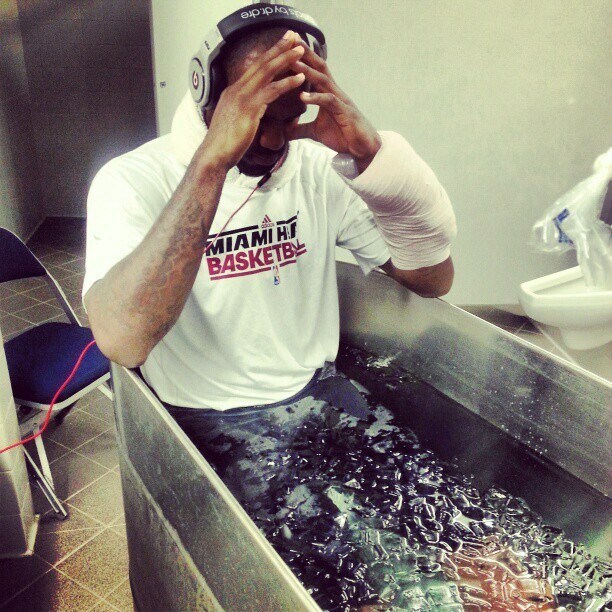 Other cold therapies that LeBron does to help keep him healthy includes cold tubs and cryotherapy chambers. Cryotherapy chambers have gained popularity in recent years but are drastically different than the good old ice bath. If you’re a fellow Arizonian, take a dip in your non-heated pool. As we age BAT decreases. Decreased BAT is one reason why an 86 year young whippersnapper has a greater chance for metabolic disease than a 4-year-old. People who are obese and have chronic disease also have lower levels of BAT. Why is there more sickness in humans during winter? Is it lack of cold (and light!) exposure due to heating systems in our homes and cars? As a part of adaptation to winter, animals in the wild increase their BAT to help keep them warm. This a major reason why animals are more ripped in the winter. Aside from increasing BAT, icing injured parts of your body help to prevent further swelling and damage to the uninjured tissue that surrounds the damaged cells. For full-body cold therapy take a dip in your non-heated pool. For spot treatment cold therapy, use a bag of ice. LeBron lookin all stoked to be on the Normatecs! Although, not the same as compression therapy, legs up a wall is magical and works similarly to return blood to your heart from your legs. You have many different options for electrostimulation devices for recovery. Google it, and you’ll see how many options are available to you. LeBron’s choice, according to a post on his Twitter account in August 2014, is Compex. 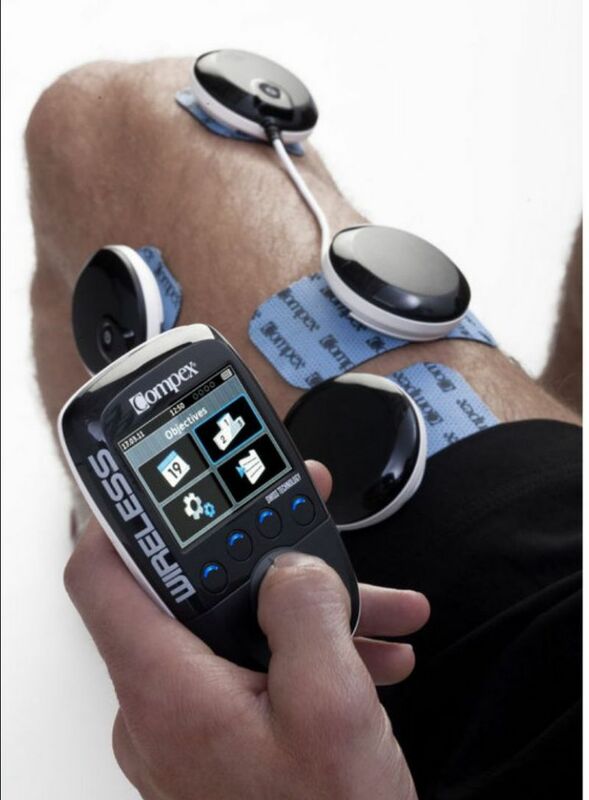 Many electrotherapy devices today are “smart” or wireless, including Compex. I would not recommend that you wear any “smart” device. These wireless electrotherapy devices work by sending a signal (EMF) from a remote device or your phone to the pads that are on your body. For your body to receive electrical current, it must be transduced from the EMF (radiofrequency) signal coming from your phone and converted into an electrical current. This means that a transducer must be in the pads that are connected to your body. Sounds like more EMF exposure to me! If you want to invest in electrotherapy, I advise you to go old school with a wired device. I’ll cover my favorite electrotherapy device in a future post. Until then check with your doctor to see what electrotherapy device is best suited for you. Grounding/earthing. Not the same as electrotherapy but it has an electrical benefit by discharging electrical charge that you build up. Build up is common due to wearing insulated (non-conductive soled) shoes and being in clouds of EMF all day long. Your boy LeBron knows what’s up! He gets 8-9 hours of sleep per night in addition to a nap that could be as long as 2.5 hours. Your boy LeBron also knows the importance of REM sleep. 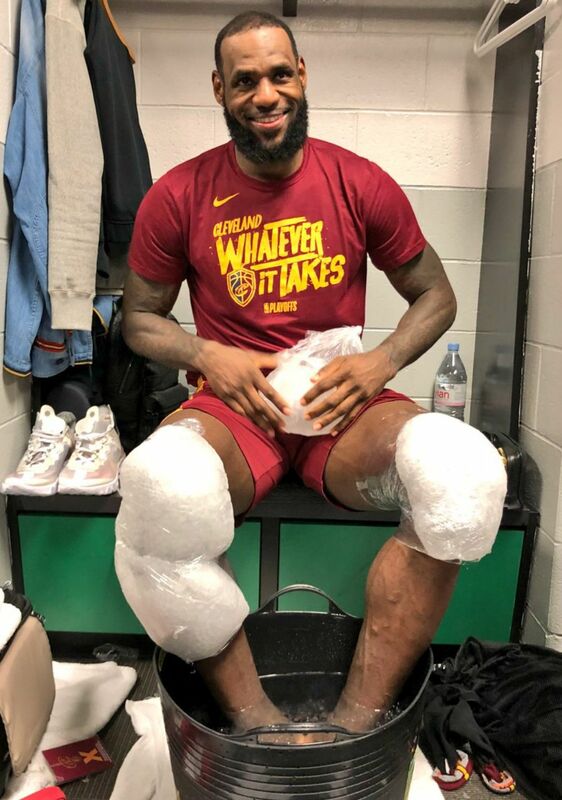 LeBron uses several strategies to help him get the shuteye including sleeping in a dark, cool room, and it “needs to be comfortable,” LeBron stated in his recent podcast with Ferriss. LeBron also indicated that he uses a sleep app called Calm. 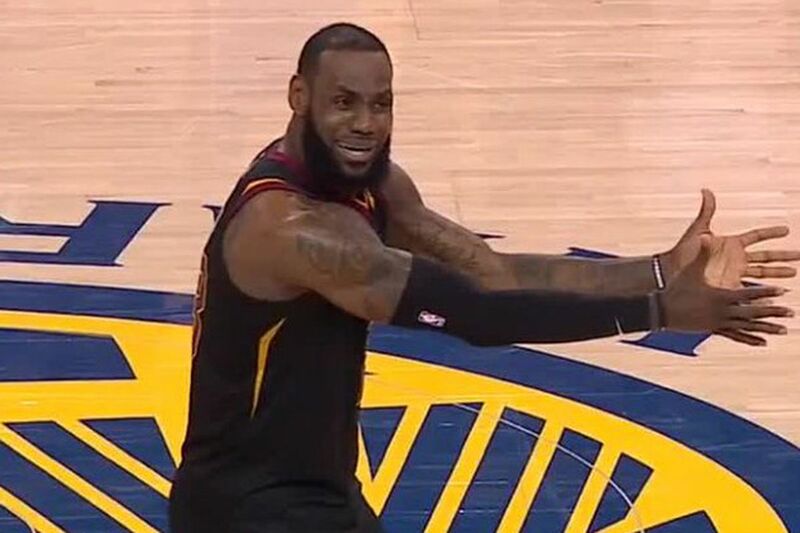 And your boy LeBron cuts off his electrical devices 30-45 minutes before bed (LeBron is a pushover when it comes to his electrical device recommendation. In the winter you gotta give up the electrical devices earlier). 1. Sleep 7 hours and take note of how you feel. 2. Sleep 9 hours and take note of how you feel. 3. Compare 1 vs. 2. 1. If you have a recent injury, ice the area with an ice pack or frozen vegetables. For HUGE effects on metabolism and recovery, take a cold shower in the morning or even better sit in your non-heat pool for a couple of minutes 1-3 x/week. The temperature of your pool will be around 45-47 degrees now, so hopefully, you’ve been adapting to the fridged temperatures over the last couple weeks. 2. One of the best ways to help you recover is putting your legs up a wall after a workday. This is especially important if you sit or stand for much of the day. 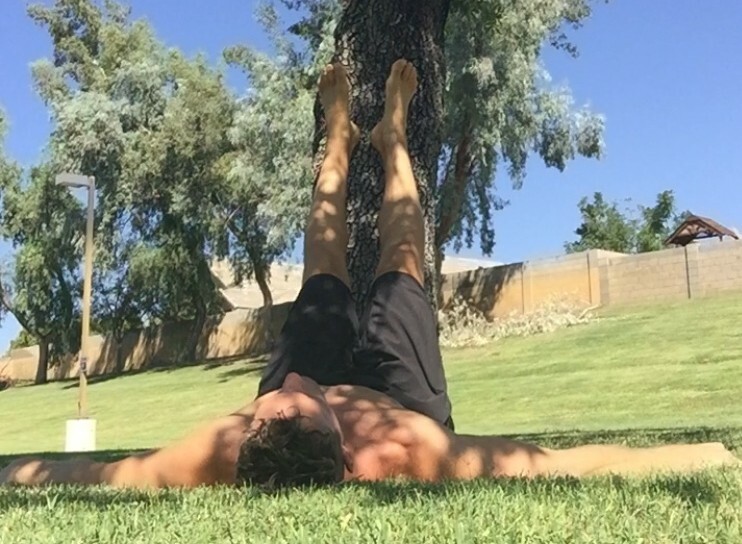 If you have a grueling leg workout, throw your legs up a tree for some dope recovery! 3. Electrotherapy is awesome for creating a current around tissues. Current is how your tissues heal. If you’re not ready to invest in LeBron’s Compex, go outside barefoot on concrete or even better grass and discharge a couple of times throughout the day. 4. Sleep is paramount for recovery and your health. In the winter, when there’s more darkness, your metabolism tanks. If you want optimal recovery and health, you must offset the stress of darkness by sleeping more in the winter. Blocking blue light from your eyes after sunset is not enough for your brain and body to heal. Get that REM sleep! 5. The real magic in LeBron’s performance, in my opinion, is his time management which allows him to be consistent–it’s not all of his recovery toys. When he was on Ferriss’ podcast, he had ice packs on his body. He is a master at managing his time. You can do the same by throwing a pack of frozen vegetables on your knees after a leg workout while you eat dinner.